The plot is still a mess. 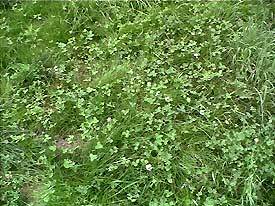 The clover that we re-seeded has not come up, mostly due to a lack of rainfall in this area. 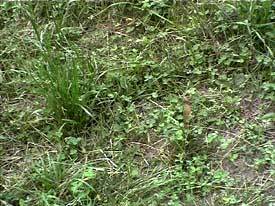 The existing clover and alfalfa is sparse and discolored. Large dirt patches are common throughout the plot. However deer sign is evident, including droppings, fresh tracks, and browse. 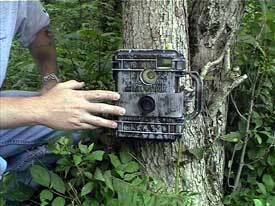 With the help of my hunting partner Bill, we set up a Buckshot 35 trail monitoring camera for (2) 24 hour periods. The first period we watched a trail that leads to the west end of the plot, and the second evening we watched the east trail. 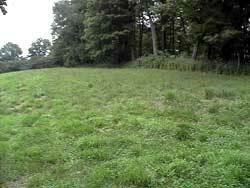 We wanted to see if there was anything using either trail and how much activity despite the plot's poor condition. The Buckshot 35 Scout is chained to the tree and locked. Bill then sets the height and angle of the infrared detector. The same procedure was done at the west end of the plot the following day. 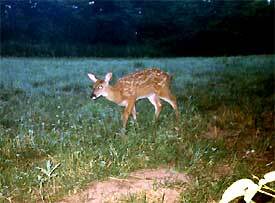 WEST - This fawn was captured by our BuckShot 35 shortly before nightfall. Along with a red fox, and several rabbits, no other deer were detected from the west end of the plot. 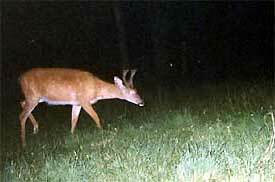 EAST - This young buck was caught as he walked by the camera on the east end of the plot. I had seen this buck once before while bush-hogging the land in early summer. He was accompanied by another, bigger racked buck at that time. EAST - This doe was leaving the plot on the east end when she was caught by our camera. 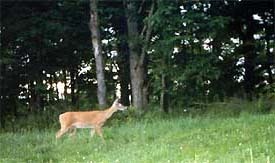 There were two other deer caught however they were by the tree line and could barely be seen in the photos. 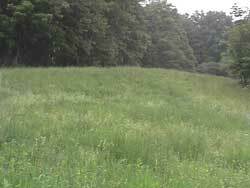 While our main food plot (above) was doing terrible, our small food plot was faring a bit better. Still the extreme dryness in this area has really affected crop production and all we can do is hope for moisture before the deer season. We also found a new spot to run an experimental planting of Buck Forage Oats. We picked out an area that was 30 yards long by 15 yards wide and sprayed Roundup to kill the vegetation. We will return in three weeks to plant that plot. For our game monitoring we used the Buckshot 35 Scout which features an infrared (heat detecting) beam, sensitivity settings, and can be locked directly to the tree. Please visit Buckshot 35's website for more trophy photos!